More than five percent of ‘deaths’ in England are attributable to long-term exposure to particulate air pollution, according to the latest data published in the Public Health Outcomes Framework (PHOF). The precise estimate is that 5.3 percent of mortality can be attributed to long-term exposure to small particles polluting the air. This estimate makes air pollution the largest environmental risk linked to deaths every year. The calculation is based on human-made particulate air pollution less than 2.5 microns in size called PM2.5. While this is the fourth year of data, it is too early to read a trend because individual years are likely to fluctuate due to changes in weather conditions. This is why we continue to use the estimates we made last year in our report: Estimating Local Mortality Burdens Associated with Particulate Air Pollution. As you will see, we estimated that long-term exposure to particulate air pollution has ‘an effect equivalent to’ around 25,000 deaths a year in England. It is important to understand that long-term exposure to air pollution is not thought to be the sole cause of deaths. Rather, it is considered to be a contributory factor, probably to many more than 25,000 deaths. For example, given that much of the impact that air pollution has on mortality is linked with cardiovascular deaths, it is considered that it makes a contribution to some, or perhaps even all, cardiovascular deaths. While air pollution is generally considered a contributory factor to mortality, there is evidence that outdoor air pollution causes lung cancer. Diesel engine exhaust, outdoor air pollution and particulate matter have all been classified by the World Health Organization as carcinogenic to humans. Air pollution affects our daily quality of life as it can exacerbate lung conditions such as Chronic Obstructive Pulmonary Disease (COPD) and asthma. People with COPD have difficulties breathing, primarily due to the narrowing of their airways. Additionally, air pollution can reduce lung development in children, which may increase symptoms in children who develop conditions such as asthma. Back in the Nineties it was felt that air pollution was no longer a major health issue in the United Kingdom. After all, legislation had made the great smogs of the Fifties a thing of the past. But evidence started to emerge that small particles emitted to the air from various sources, such as road transport, industry, agriculture and domestic fires, were still having a considerable effect on health. This type of air pollution is so small that it can’t be seen by the naked eye, but can get into our respiratory system. Other air pollutants, such as the gases nitrogen dioxide and ozone, can also affect our health. Nitrogen dioxide is produced by burning fuel, whilst ozone is formed by chemical reactions in the air. Long-term exposure (over several years) to particulate air pollution affects deaths from the same sorts of diseases as smoking. But some deaths are largely caused by smoking or there is at least a close link to it. The same is true of alcohol. 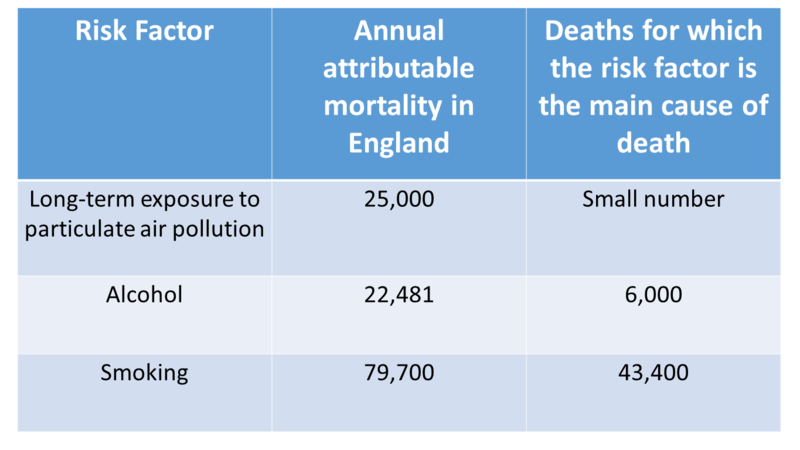 The table below shows estimates of yearly mortality in England and the number of deaths for which the risk factor is the main cause of death. There is also evidence that some deaths are brought forward by short-term exposure (over hours or days) to air pollutants such as particulate matter, nitrogen dioxide and ozone, although the numbers are estimated to be lower than for long-term exposure. 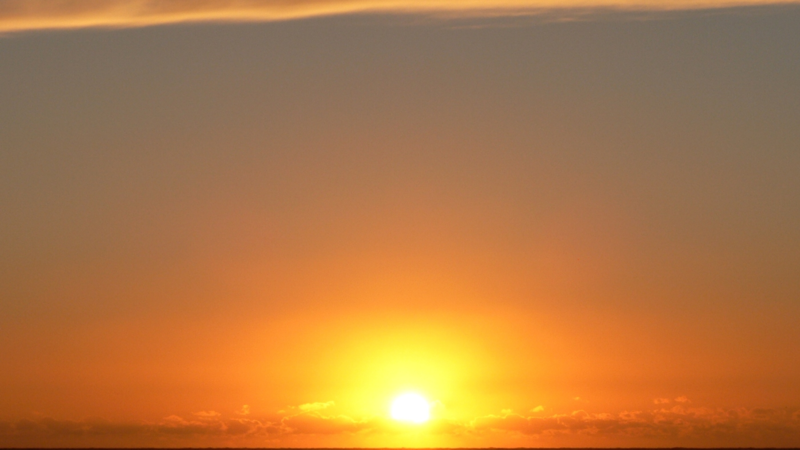 Episodes of poor air quality can also make the symptoms of heart and lung conditions worse. National and local government can help reduce air pollution by promoting a shift from cars to walking and cycling. In addition, they can promote an integrated public transport system, which would help reduce congestion, and introduce Low Emissions Zones as well as parking restrictions. Businesses also have an important role to play by introducing incentives for staff to walk or cycle to work, take up car sharing or work from home. But we can all do our bit to improve air quality. For example, by walking or cycling to work and school we can improve our health through exercise, limit air pollution and reduce carbon dioxide emissions which are responsible for climate change. Everyone will need to do their bit if we are to significantly improve air quality. But while the impact of the individual household or business may be small, the combined impact of actions taken by national and local government, large and small businesses and individuals could be great.